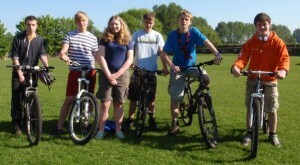 Explorer Scouts usually aged between fourteen and eighteen years old. They make up the fourth section of the Scouting family; in Carshalton they are known as the Double Dragon Explorer Scout. There are many types of Explorer Scout Units; some may be linked to your Scout Group while others may be based around different activities. Not all Explorer Units meet each week, because you will often be out and about at weekends or in the holidays doing activities. There will be times when you will be busy doing other things such as exams, and being an Explorer Scout will have to fit around these.